Brigitta Sinka, an 87 year old Hungarian chessplayer, has broken the record for the most number of simultaneous games played in a career, having just clocked up her 13,600th game. More correctly, she has broken Jose Capablanca's record of 13,545 games, which is believed to be the previous record. Of course such claims are sometimes difficult to prove, but in her case she has kept a record of the 13,600 games she has played, starting back in 1957. A lot of the games were played at holiday camps for children, but I suspect even then the quality of opponents would be reasonably high, being Hungary and all. Nonetheless I would not be surprised if there are players who have played more games than this, just without the requisite documentation. One name that springs to mind is Joseph Henry Blackburne, who made his living from simultaneous displays. He had a very long career stretching from 1862 to 1921, and it is estimated he played 100,000 games over this time. Assuming he played simuls for 50 years, and 20 board simuls were typical, he would only need to play 20 simuls a year to clock up 20,000 games. But based on his own collection of best games it seemed he played many more than that annually, so even 20,000 seems to be an underestimate. One of the significant differences between Australian and European Chess (at least in my opinion) is how we deal with cold weather. For most of Australia cold weather doesn't really exist, and so we tend not to prepare that well for it. On the other hand, cold weather (and snow and ice) is a regular part of the European winter, so when it happens, everyone is prepared. This was brutally highlighted today when I ran the ACT Under 8 Championships. It was held in an unheated school hall, for 24 brave contestants. For most (if not all of the day), the temperature would have been below the age limit for the tournament. This had a couple of effects on the running of the event, although not on the level of play. Setting clocks took a little longer, as my fingers were not able to operate properly. I was also a little lenient on the 'no running in the hall' rule, as this seemed to be the best way to stay warm. And finally, while the little bar heater provided some warmth for parents, I am thinking about renting microwave warmed wheat bags out at the next event at the venue. As for the chess, Dexuan Kong won the tournament with 8/9, a point ahead of Victor Ni, Arnav Jain and Piet Clayden. Hannah Ni was the best placed Under 6 player, while Stella Pugmire won the Girls prize. The 2015 Gold Coast Open is currently underway at Somerset College, Mudgereeba. Along side the tournament are a number of other activities including the JETS Training squad (for Australia's up and coming junior players) and a coaching session for some of Australia's top female players. As part of this training there is going to be a 6 board match between an Australian women's team, and a Norwegian women's team. It is going to be played over the internet (of course) and will be hosted by Chess24.com The match starts at 7:00pm tomorrow (Sunday) and will last around 2 hours. Not only will this event provide a bit of extra practice for the Australian players ahead of next weeks Oceania Zonal, but if it is a success, be be a precursor to future matches involving both Female and Open teams. Australian/American GM Walter Browne passed away on the 24th June 2015 in Las Vegas. He had just completed a series of chess and poker events in the city, and died in his sleep while staying at a friends place. Born in Sydney in 1949 he was sometimes regarded as Australia's first Grandmaster, earning the title in 1969 while playing under the Australian flag. However he lived all but the first part of his life in the United States, and after representing Australia at the 1970 and 72 Olympiads, shifted to the US for the rest of his career. He won the United States Championship 6 times (3rd most wins after Fischer and Reshevsky) and the Australian Championship in 1969. He scored a phenomenal 31.5/41 on board 1 for Australia at 2 Olympiads, winning individual bronze medals both times. He also played poker, competing in a number of events, and winning some substantial prizes along the way. As a player who was habitually in time trouble it was no surprise he was a fan of blitz chess. He even went as far as forming the World Blitz Chess Association, and producing a magazine "Blitz Chess"
Possibly his most famous game was a win over Arthur Bisguier in 1974. The brilliant Bh6 was a complete surprise to his opponent, and at the time there were suggestions that this might have been a Fischer invention. Oddly for such a brilliant move, it quickly reached a rook and pawn ending, but one in which Browne was winning. Miles Patterson tipped me off to a set of very entertaining chess videos that can be found on youtube. The are under the collective name off "Banter Blitz" and consist of recordings of strong players playing online opponents at 5 minute chess, while providing running commentary during the game. The roll call of players taking part is quite strong with Peter Svidler and David Smerdon on the list. But the real highlight are the clips from Miss Strategy (IM Anna Rudolf) and Miss Tactics (IM Sopiko Guramishvili) where they spend a couple of hours playing on chess24.com In one clip Miss Strategy leads the way, while in the second Miss Tactics handles the mouse. Their commentary is both funny and informative, and you could do worse than spend a couple of hours listening to the thought process of some high class blitz players. The better you are at chess, the more consistent your play. Although like most generalisations, this is only true until it is false. As someone who watches a lot of chess in person, I usually get to see players of all strengths throughout the year. From the absolute randomness of interschool chess to the iron precision on the top boards of the Chess Olympiad, the stronger the players the fewer the mistakes. But as someone who enjoys the game for the games sake, my more enjoyable games are the ones with shifting fortunes. The most common venue for these sort of games are weekend chess events, usually between boards 5 and 15. Above or below that one mistake (small at the top, big at the bottom) will decide the game, but in the middle, it is more missed opportunities and slight miscalculations that define the game. The following game fits the narrative of a 'weekender game', but was definitely not played at one. It was played in the current Capablanca Memorial, between Ian Nepomniachtchi and Yangi Yu. Yu is completely dominating this event, starting the double RR with 4.5/5, but did have a bit of escape in this game. A sharp Sicilian saw both players attacking on opposite sides of the board, before Nepomniachtchi found a lovely queen sacrifice to gain a winning advantage. But like in so many weekender games Black fought back, and White had to run his king up the board. Then just before the time control Nepomniachtchi played an obvious move (37.e7) which turned out to be the losing one. With his king in the centre of the board, this one tempo allowed the Black pieces to start checking and a few moves later Yu had picked up a loose piece and with it the game. A poor return for such adventurous play from Nepomniatchi, but something that a lot of 2000 strength players can sympathise with. Rarely has someone coming last in a tournament garnered more headlines than someone coming first (although the Carlton AFL team may be an exception), but this is the fate that has befallen World Champion Magnus Carlsen at the 2015 Norway Chess Tournament. After his sensational loss on time to Veselin Topalov in Round 1, he hasn't been able to take a trick, losing to Fabiano Caruana in Round 2, and Viswanathan Anand in Round 4. The only thing stopping him from 'long castling' in the tournament (slang for going 0-0-0) was a round 3 draw against Anish Giri. But even here Carlsen would not have been happy, missing a tactic (spotted by Kasparov among others) that would have ended the game in his favour. There are two theories about Carlsen's poor performance. The first is that simply the loss in round 1 (in a totally won position) has thrown him off balance. The second is that he does not perform well in home events, having not won this event in the previous two years, and the Tromso Olympiad was also a poor tournament (by his standards). Basically I think both theories are correct, and have feed into each other, magnifying Carlsen's problems. Today is a rest day in the tournament, with Round 5 being held tomorrow. Veselin Topalov (Carlsen's round 1 opponent) leads the tournament with 3.5/4, with Hikaru Nakamura in second on 3. Full coverage (including replayable games) can be found at the tournament website. The diagram to the right is an approximation to a position I saw at the ANU Chess Club on Wednesday night. I'm pretty sure it isn't quite exact, but is close enough for the purposes of this post. Clearly White is winning, with some sort of doom about to occur down the open h file. And indeed the obvious 1.Qh2 is the quickest way to end the game. Black replied by running the f rook across the back rank 1. ... Rfe8 (again this may not have been the actual move). So White now has a choice of winning ideas, but here it began to go wrong. Spotting a brilliant finish to the game, White went for a Q and R sacrifice. 2.Qh8+ Bxh8 3.Rxh8+ Now if Black plays the obvious 3. ... Kxh8 it is all over after 4.Bxf6+ Kg8 5.Rh1 But Black chose the only other legal move in the position 3. ... Kg7! and White must have realised something was wrong. f6 is protected, and Rxh8 is on the cards so White charged on with 4. Rh7+ Only now did Black capture with 4. ... Kxh7 (4. ... Kg8/f8 still loses to 5.Bxf6). There followed 5.Bxf6 with the threat of Rh1+. But with the king on h7, rather than g8, Black had one way to escape, and he took it with 5. ... g5! 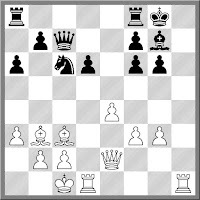 To his horror White realised there was no longer a mate, and down a Q+R for Bishop, he resigned. I wouldn't call 2.Qh8 an outright blunder btw As the defensive idea was a four moves down the track, and involved a couple of subtle defensive moves, it was more like a tragic miscalculation. So I was feeling a bit sorry for myself (and annoyed as well), when I heard about Magnus Carlsen's first round game at the 2015 Norway Chess tournament. Having ground down Veselin Topalov he reached move 60 and relaxed a bit, expecting some extra time to be added to his clock. What he failed to remember/realise was that the event was using a new time control (the third new control in 3 years!) and while he had received extra time at move 40, there was nothing added at move 60. As a result his think over move 61 took too long and he lost on time. As usual he took his defeat in his stride, acknowledging that it was his responsibility to know the tournament conditions. On the other hand the time control was new, and possibly unique at this level, with the players getting 120 minutes for the first 40 moves, then an extra hour added after that, with the 30 second increment also starting after move 40. To be honest I am not keen on the shift back to sudden death time controls at the top level (ie no increment before the first time control). I understand it is about making chess more dramatic (who doesn't love a time scramble), but I think it can detract from the overall result and quality of the game. At some point in the past I had a post about chess tournaments for money probably being illegal in the Australian Capital Territory (although I cannot now find the post!). This is due to the wording of the legislation related to the Canberra Casino, and other gambling related activities. It turns out that the ACT is not the only jurisdiction that has this issue, with Arizona in the US being another battleground. Well battleground is probably too strong a word, as it seems to be a one man campaign from a disgruntled poker player. John Schnaubelt wants the upcoming US Open (being held in Arizona) declared illegal, as it is a game that offers cash prizes. He contends this is exactly the same as poker games he wishes to host and yet the state gaming authority refuses to give him a permit. The 1922 London tournament has always held a bit of a fascination for me. Initially this was due to the participation of Charles Gilbert Watson, one of Australia's strongest, yet somewhat unknown players, of the inter-war period. But apart from that, it was still an incredibly strong event, with Capablanca, Alekhine, Euwe, Rubenstein and Reti in the field. While Capablanca was already World Champion, and Alekhine and Euwe were to claim the title in the future, it was also one of the last strong results for Akiba Rubenstein. He scored 10.5/15 (Capablanca won with 13 points), and played a number of fine games. Having recently been playing through the games from this event (and reading Maroczy's book of the tournament) , I was struck by how versatile a player Rubenstein was. While he was rightly recognised as a master of the rook and pawn ending, he could play some fine attacking chess when required. In the following game he dismantles Victor Wahltuch in pretty short order, after Wahltuch castles queenside, and then gets his pieces in a tangle. Rubenstein was even able the eschew the obvious win of a queen while conducting his attack, only capturing when it was absolutely necessary. I came across not 1, but 2 articles on interesting designs for chess sets today, and I thought I would share both with you. There is some overlap between the two articles, but if you, like me, enjoy looking at interesting and offbeat sets, then it is worth reading both articles. Some of the sets have been featured on this blog before (both mention the Bauhaus design set I like very much), while some are new to me (the typographical set jumped out at me). Of course while I like the look of these sets, and would even consider buying a few, I would never actually play a game on most of them! The two articles are "28 Coolest Chess Sets that Could Blow Your Mind" and "30 Unique Home Chess Sets"
The Norway Chess 2015 event kicks off this Monday evening (Canberra time). Now in its third year, the event is also the first tournament in the 2015 Grand Chess Tour. The tournament is ridiculously strong, with most of the top 10 taking part. It is very rare to see a tournament where Lev Aronian is only seeded 7th, but he is in this one. The first event is the now traditional Blitz event. This will be played on Monday, and will determine the pairing numbers for the rest of the event. The tournament proper begins on Tuesday and runs until the 25th of June. As it is in Norway I am going to tip Carlsen to finally win his home event. This is helped a little bit by the absence of Karjakin, who despite winning the previous two tournaments is not in the field this time. It will also be interesting to see how the resurgent Anand plays, but given recent form, I would not be surprised if he is on the podium at the end of the 9 rounds. The tournament home page is 2015.norwaychess.com and you should find all the modern tournament goodies (live games, commentary, downloads etc) there. I had a couple of very strange experiences last Wednesday evening. Wednesday is the club night for the ANU Chess Club, and as I normally function as the "House man", I am never sure whether I will get a game or not. It turns out that my services were required, and I did play. But just before the game started I noticed that my wedding ring wasn't on my finger. This came as a substantial shock, as I have worn it since I was married almost 20 years ago. Not knowing at what point it disappeared I had a quick look around, before starting the round, and my own game. For the first part of the game I was torn between finding the best moves, and finding the ring. Eventually the game reached a point where I needed to focus, so the missing ring was pushed to the back of my mind. In spite of, or even because of, the missing ring, I didn't play any horrible moves, and reached a position where I had an advantage on the kingside. At this point the second strange thing occurred. Not finding a breakthrough on that side of the board, I looked instead at the queenside, which is something I almost never do. Playing b3, followed by a3, I was able to land a rook on the 7th rank, which gave me a clear cut advantage. By now the missing ring had been put into the "deal with it later" file, and after returning once again to the kingside, I was able to open up the position and reach a winning ending. While I was pleased with the game, I am still missing the ring. The only other consolation from all this is the fact that the ring simply slipped off my finger is evidence that regular bike riding and a better diet is having an effect, positively on my weight, although negatively on my marriage. At schools events the 4 move checkmate is of course a regular occurrence. It may be a testament to the improving levels of chess knowledge amongst young players that it seems either less common, or at least, not happening in its purest form. I've seen a few 1. ... e6 openings throw a white player for a loop, while early queen moves by Black at least allow Kd8 after Qxf7. But today I saw a completely new variation on this theme. Answering the question "Is this checkmate?" I immediately noticed the queen on f7, with the Black king having nowhere to run. But when I looked for the bishop on c4 it was not there. In fact it was still at home on f1. Instead White had performed a rook lift via h3, and the supporting piece was happily sitting on f3. But mate is still mate, no matter how it is achieved, and so the inventive White player still scored the point. It has been a while since I have blogged about the weird and wonderful "rules" that players believe are proper chess rules. The most recent addition to my list came from a schools event I ran last week. One poor player, playing in their first proper chess event, was most upset when he was told he had been checkmated. Wile he accepted that yes, he was in check, and yes, there was no way to get out of check, it still didn't count as he still had his queen on the board. "You can't get checkmated while you still have a queen" was his claim, a claim I had to explain to him, was incorrect. Nonetheless this "rule" may make a interesting chess variant. Even if you are checkmated with queens on the board, you can still play on, as long as your queen survives. The game might then turn into a battle between the enemy pieces and the queen, while the defending side could be torn between using the queen to lift the mate, or hiding her as far away as possible. I suspect the overall result would be longer games, but on the other hand, players would be less inclined to swap queens in the opening. One of the quickest games played during last weekends NSW Open was this brevity executed by Shay Keinan. It is a trappy line in the Morra Gambit, and Black very helpfully walked right into it. 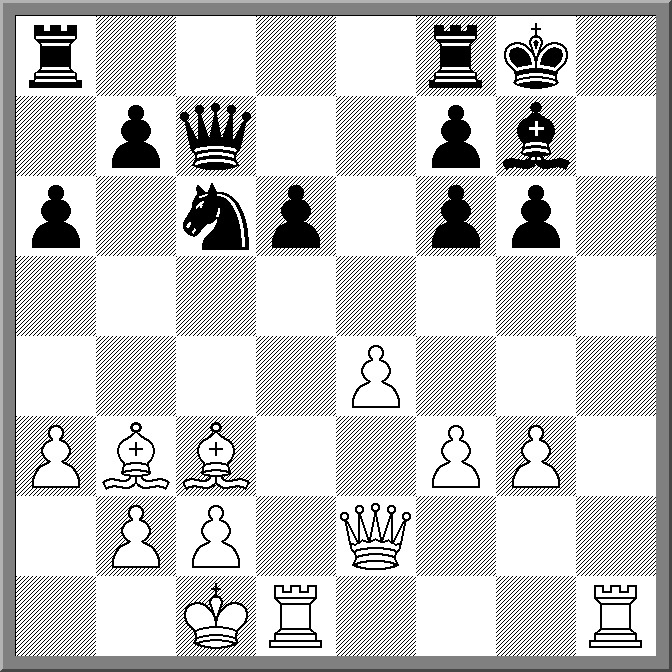 While White is already on top as early as move 8, it is only the disastrous choice of 9. ... Kd7 (instead of 9. ... Rb8) that allows White to slam the door shut. The final day of the 2015 NSW Open once again saw an unpredictable tournament throw up more unpredictable results, with the final results resting on the last game to finish. After a dismal round 5 loss to IM Richard Jones, very few would have put money on IM Anton Smirnov to recover on the final day to grab a share of 1st place. He did this in part by beating top seed GM Hrant Melkumyan in an interesting game where an out of play rook proved the difference. With this win, Smirnov moved to 6 points, where he was joined by IM Max Illingworth, who beat Pengyu Chen in his round 7 game. Third place was taken by GM Zong Yuan Zhao, who capped off a stuttering event with a win over CM Blair Mandla, in a sharp, but brief game. The Under 200 prize was shared between Bruce Murray (despite a disastrous loss to Illingworth on round 6) and Harry Press, who went from 0/2 to 4.5/7 by "submarine-ing" his way through the field. The Under 1800 prize was shared by Glenn Ingham, Hennig Muller, Chris Ball and Kamal Jain, with 4 points. The Under 1600 event (with its $1000 first prize) was won by Ranganathan Parunithan, who jumped out in fron with a win over Thomas Johnston on board 2. Tim Pearce and Albert Winkelman had a chance ti join him in first, but could only draw their final round game on the top board. The 110 player event (run in two sections) was certainly an enjoyable tournament, from an arbiters point of view. There were only a few (minor) incidents, most of which were sorted out with a kind word and a smile. The venue was also a surprise, with the Chatswood Club proving to be a bit of a hidden gem in the hustle and bustle on commercial Chatswood. Based on the feedback I received most players found the tournament to be a worthwhile activity and are looking forward to the 2016 edition. The second day of the 2015 NSW Open got off to a dramatic start when IM Gary Lane scored a surprise win over GM Zong Yuan Zhao. Zhao had held the advantage for most of the game, but lost track of his time, and let his clock run down to 0 without realising it. In the next round Lane then faced IM Igor Bjelobrk, and in a rook v 2 minors ending, Bjelobrk was able to catch Lane's king in a mating net. IM Anton Smirnov then took the opportunity to take the outright lead, with a win over IM Max Illingworth. This left Smirnov half a point ahead of Igor Bjelobrk and IM Richard Jones, who had a win over Glenn Ingham. The the final round of the day saw the lead change one more time after Smirnov fell apart against Jones, while Melkumyan and Zhao drew the longest game of the round. The win by Jones leaves him half a point ahead of a chasing pack that includes Smirnov, Illingworth, Melkumyan, Bjelobrk, Pengyu Chen, and Arthur Huynh. Tomorrow round sees Melkumyan against Jones on Board 1, with Smirnov v Hunyh, Bjelobrk v Chen, and Illingworth v Bruce Murray. In the Minor (Under 1600) Albert Winkelman leads with 5/5. He holds a full point lead over a group of 7 players, and is up against Thomas Johnston in tomorrow mornings round. The 2015 NSW Open seems to be a particularly strong event this year. Even with a couple of last minute withdrawals, the top of the field still sees 2 GM's and 5 IM's taking part. The tournament even attracted a good sized field given the change in venue, with 52 players in the Open, and 58 players in the Under 1600. The first two rounds saw most of the top seeds emerge unscathed. In fact all the GM's and IM's went 2 from 2, although some had to work a little harder than others. As a result Round 3 (which is under way as I type this) will see the first of the big clashes, with IM Bjelobrk playing GM Melkumyan on Board 1, while GM Zhao is up against IM Lane of Board 2. The top boards of the Minor (Under 1600) were a much more random affair, with a number of higher rated players coming undone. Only 2 of the top 10 seeds are on 2/2, with young Albert Winkelman (seeded 33rd) continuing a tradition of Canberra Juniors doing well in this event. Full results from the event, live broadcasts of games, and pgn files for the top 6 boards of the Open can all be found at nswopen.nswca.org.au There are 2 more rounds today (2pm and 6:30pm) and two rounds tomorrow to compete the event. Heading off to Sydney tomorrow to be an arbiter at the 2015 NSW Open. New venue this year, with a move from Parramatta to Chatswood. As with lots of tournaments, such a move often causes some players to think twice about entering (due to an inability to handle change), but this years event has already topped the 100 player mark, and is looking very strong at the top. All the active Sydney GM's/IM's have entered as well as a couple of OS visitors (GM Melkumyan and IM Richard Jones). Entries are still being taken on the day if you still wish to enter, but you need to get to the venue before 11:30am. Full details of this event, including the current list of entries can be found at http://nswopen.nswca.org.au/ Also use this link for tournament standings and links to the live broadcast of the top boards. Spotted an oldie but a goodie at the ANU Chess Club last night. I'm surprised it still catches out Caro-Kann players, although this particular variant might be further off the beaten track. Instead of going for the obvious 8. ... g6 to defend f7, Black tried the more aggressive 8. ... Qd5. 9.Bc4 was still the move (as it was against 8. ... g6), when Black is almost forced to play g6 anyway. White still got to capture on f7 after the queens were chopped, and then the calm retreat along the a2-g8 diagonal left the rook in the corner trapped. During my time on the FIDE Anti-Cheating Committee I discovered that the rules we proposed didn't go far enough to eliminate cheating, and at the same time went too far in an attempt to eliminate cheating. For some, any imposition on players and organisers to prevent cheating (metal detectors, storage areas for phones, or the searching of players) would stop events being organised and result in the death of chess itself. On the other hand, by not insisting on stringent requirements, and preventing even the slightest chance of cheating, would result in events not being organised and the death of chess itself. But in what might come as a shock to almost everyone who plays chess, there needed to be a middle ground, where organisers had the power to act against potential cheats, but do so in a sensible and affordable manner. There also needed to be penalties for those caught cheating, but at the same time, a method to prevent players from being accused of cheating,without any consequences if the claim was false. This was brought into focus by the recent happenings at the European Women's Championship. WGM Mihaela Sandu got off to a flying start, at which point a number of other competitors asked the organisers to delay the live broadcast of her games. This was done via the rather crass tactic of putting up a petition on the notice board at the hotel where the players were staying.The organiser in fact did accept this request for a round, before the blow back made him reconsider. The upshot was that Sandu lost her last 4 games, a whole lot of people have had their reputations damaged, and further action may be on the cards. The real problem though was that the Chief Arbiter blundered right at the start of the process. One of the things the FIDE Anti-Cheating Regulations was sure to include was a process for handling accusations. If any of the players had a suspicion that a player was cheating then they needed to make a formal complaint to the Chief Arbiter. This cannot be done anonymously, and for anything further to happen the player has to put their name to the complaint. If they don't, then that is the end of the matter. If they do, the arbiter is obliged to investigate and report to the FIDE Anti-Cheating Commission. Importantly, if a complaint is made privately, then the process remains confidential. Then the case can either go three ways. A breach of the anti-cheating regulations is found, and the player is sanctioned; or insufficient proof is found, and there is no sanction on the player; or no breach is found and the Anti-Cheating Commission decide the initial complaint was unfounded. In the final case, there can be sanctions against the player(s) making the complaint. Now this may seem a little harsh, but the issue of false complaints was a real concern. It was felt that this was the best way of balancing the competing issues, without deterring well founded complaints. In the Sandu case, a bad move by the Arbiter/Organisers not only affected the performance of one of the players, but has also opened up the possibility of sanctions against a number of other participants. One of the more common comments I (and I am sure others) get when people find out you play chess is "You must be smart to play chess" or "I'd love to play, but I'm not smart enough'. In an effort to encourage potential new players the response is normally "Oh, I'm not that smart" or "I've met plenty of dumb chess players" or of course "It's not that hard, really". This seems to have little effect in dispelling the notion that you have to be a brainbox to play, and I've often thought of tipping this on its head. "Yes, I am smarter than you" or "Chess - only smart people play" are two such slogans I've come up with in this vein. Whether non-players would get the joke is probably unclear, although the fact they don't might actually prove the accuracy of the slogan. To support the assertion that chessplayers do think better/faster/smarter than other people, here is an article by Ellie Kaufman titled "How Chess Players Brains Are Different From Everybody Else's" While some may dispute the veracity of some of the claims, the article does provide a summary of the various claims about chess thinking, and its effects on overall thinking and problem solving. Worth a read in preparation for the next dinner with your non chess playing friends. There was always a belief that Magnus Carlsen was the kind of future (at the time) World Champion who might have the right kind of profile to start another chess boom. While he hasn't created the numbers that took to the game after Bobby Fischer became World Champion, he does seem quite adept at publicising the game outside the usual chess arenas. Earlier this week he made an appearance at the Sohn Conference, a conference and fund raiser for research into paediatric cancer. There he played a 3 board blindfold simul in front of a large crowd, while GM Maurice Ashley provided commentary. To keep it short, each player had 9 minutes on the clock, effectively giving Carlsen 3 minutes per game. Of course blind fold simuls had been done before, as far back as 1783 when Philidor stunned Paris by playing 3 unsighted games at once. And while Carlsen's effort falls far short of the record of 52 games by FM Marc Lang, this was played under slightly more exacting conditions. As a clock simul the players could move at any time, meaning Carlsen had to "randomly access" each position (normally in simuls players move in order). On the other hand his opponents did not have the luxury of waiting while he made a circuit of the (virtual room) meaning their clocks were running down as well. In the end this seemed to help Magnus more than his opponent as he ended up ahead on the clock in some of the games, resulting in resignations from his opponents. A brief 3 minute video of the action is here, while you can find the full version on youtube.